LONDON, Oct. 10, 2014 -- Boeing [NYSE:BA] and Virgin Atlantic Airways are celebrating the delivery of the airline's first 787-9 Dreamliner. Pictured here is the airline's first 787-9 on an earlier test flight. LONDON, Oct. 10, 2014 /PRNewswire/ -- Boeing [NYSE:BA] and Virgin Atlantic Airways are celebrating the delivery of the airline's first 787-9 Dreamliner. The airline is the first European airline to take delivery of the 787-9 and plans to operate the airplane initially on its London Heathrow to Boston route. Virgin Atlantic's first 787-9 touched down at London's Gatwick Airport today following a more than 7,400 kilometer (4,000 nautical mile) nonstop flight from Paine Field in Everett, Wash. 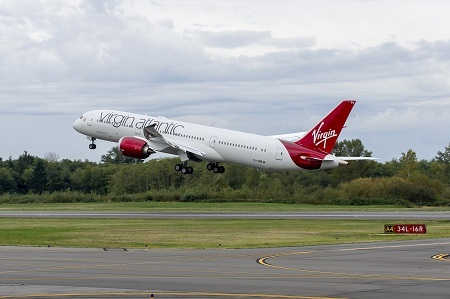 The airplane, named 'Birthday Girl' in reference to the UK carrier's 30th anniversary, is the first of 16 787-9s Virgin Atlantic has ordered from Boeing. "The first 787-9 in Europe will be a flagship for Virgin Atlantic's fleet, providing greatly improved efficiencies across its routes," said Todd Nelp, vice president of European Sales, Boeing Commercial Airplanes. "The airplane, with its unique onboard features, will provide an unrivaled passenger experience, cementing Virgin Atlantic's reputation as a true innovator in air travel." The 787-9 complements and extends the 787 family. With the fuselage stretched by 20 feet (6 meters) over the 787-8, the 787-9 will fly up to 40 more passengers an additional 830 kilometers (450 nautical miles) with the same exceptional environmental performance – 20 percent less fuel use and 20 percent fewer emissions than the airplanes they replace. The airplane leverages the visionary design of the 787-8, offering passenger-pleasing features such as large windows, large stow bins, modern LED lighting, higher humidity, a lower cabin altitude, cleaner air and a smoother ride. Based out of London's Gatwick and Heathrow Airports, as well as Manchester and Glasgow Airports, Virgin Atlantic Airways operates a fleet of approximately 40 airplanes. Along with its first 787-9, the British operator also has a Boeing fleet of 12 747-400s operating on routes across North America, the Caribbean, Africa and Asia. To date, nearly 60 customers from around the world have ordered more than 1,000 Dreamliners, approximately 40 percent of which are 787-9s.